Most of the time, whenever we head to a restaurant and pay top dollar for the kind of food and drinks that we get, we would also be on the lookout for service that is on part with the price forked out. However, not all servers are always on the top of their game, since they might have domestic issues that is on their minds all the time, leading them to deliver sub-par service which in turn would affect a restaurant’s rating. Not only that, humans can also be inconsistent when it comes to treating one from another, but not so with robots. 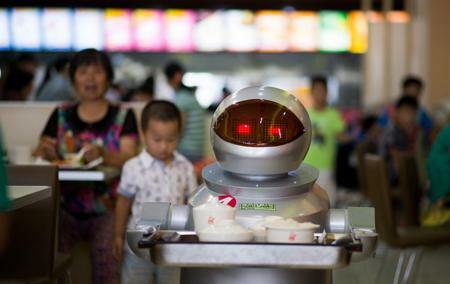 In fact, a restaurant in China is already starting to usher in a new era in the F&B industry, that is, through the use of over a dozen robots to cook as well as serve food. These mechanical staff will not only do all of the above mentioned, they are also capable of greeting customers who just walked in, although you can be sure that the greetings will be recycled and feel old after a while, coming in a digital manner. The restaurant’s founder, Song Yugang, shared, “My daughter asked me to invent a robot because she doesn’t like doing housework.” Now that is certainly an interesting way to start a unique restaurant, right? A couple of robots are placed by the door, where they do their best to cheerfully greet customers, while another quartet of short, humanoid machines will carry trays of food to the tables from the kitchen. In the kitchen itself, a couple of rather large blue robots sport glowing red eyes as they specialize in frying, with another working especially on dumplings. Such labor has an expensive initial outlay of approximately 40,000 yuan ($6,500) per robot, which is somewhat similar to the annual salary of a human employee. The advantages? The robots are able to understand around 40 everyday sentences, will not fall sick or take some time off, with just two hours of charging offering up to 5 hours of work. The robot is not enginerical to actual humanoid funtions or stealth, its mechanical impulse is not that accurate to human timing, it is a genius device of robotic funtion, but thats all it is.